It is with a heavy heart that I report the death of our beloved friend, Ruhondeza the Ugandan mountain gorilla. He died on June 27th of natural causes and was estimated to be around 50 years old, an impressive age for a wild mountain gorilla. As the leader of the first habituated gorilla family for Ugandan tourism, Ruhondeza helped make gorilla eco-tourism possible. 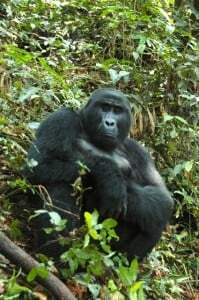 His family, known as the Mubare group, was first sighted by trackers around the Mubare hills in the Bwindi Impenetrable Forest in 1998. Since that time, thousands of travelers have passed through to visit Ruhondeza and his family. His death is a loss for everyone in the travel community, but serves as a reminder of how fortunate we were to watch and learn from him. In his prime, Ruhondeza was a proud and protective leader. He was weary of other males and often aggressive toward them. There were several brave gorillas that did their best to usurp his position, and he wasn’t defeated until last March. Trackers assume he lost due to old age. The fight left him weak, and upon losing his family to the other male, he was forced to lead a solitary life in Rubona village which neighbors Bwindi Impenetrable Park. Having tracked gorillas for many years, I know what a profound experience gorilla tracking can be. Perhaps you have also gone gorilla tracking and you know how impossible it is to explain the range of emotions one goes through. When I saw Ruhondeza for the first time, I felt an immediate connection with him. The striking similarity between human and primate is clearly evident. I will always remember Ruhondeza as a friend, gentle leader and inspiration of how we can peaceably exist with other species.